Hotel Mendez Nunez Function Rooms for holding events and banquets. We have Admiral Hall, with a capacity of 350 people and Raiña Hall with capacity for 120 people. WIFI internet connection with high speed. Business facilities: high resolution projector, integrated loudspeakers, computer rental, printer, fax and copy services, flight booking, car rental ...). Room Service: Cocktail and Coffee Breaks. The Hotel Méndez Núñez has two restaurants where you can taste our exquisite cuisine and celebrate all kinds of events and celebrations. We have a restaurant on the 1st floor, with a capacity for 350 people and is dedicated to providing the service for weddings, communions, banquets and business dinners. In 6th floor is another restaurant / cafe that is dedicated to the service of breakfast, tour groups, etc.. and have wonderful views over the old town, the cathedral. Also within walking distance guests will also enjoy other tastes such as, seafood, grilled fish or tapas. Remember the motto "E-Spot, Lugo ...". Tagline made us popular. 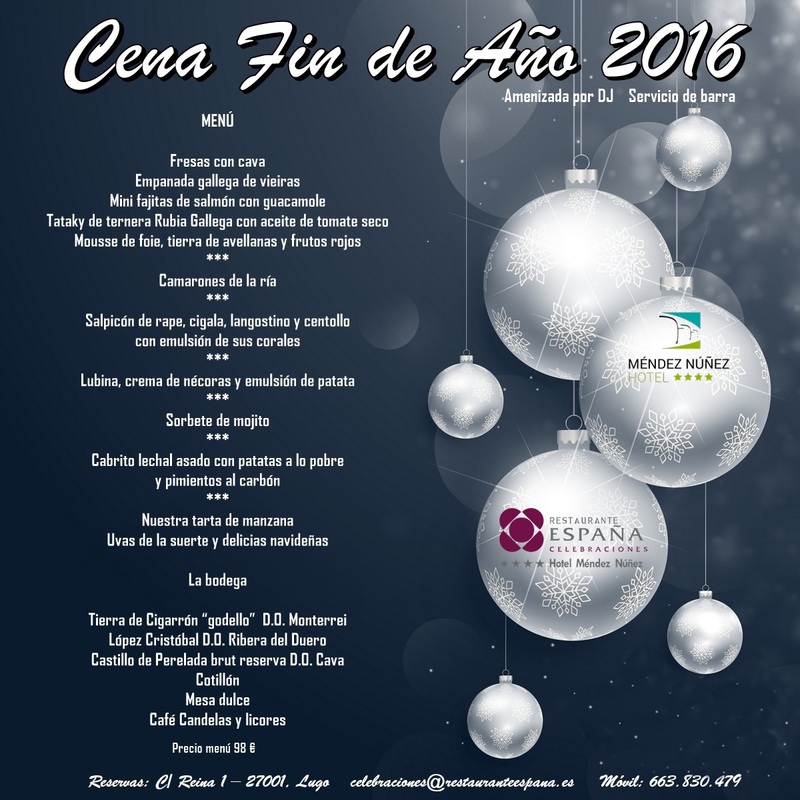 Check our New Year's Eve Dinner 2016 menu here.